Even my new Smart TV is a good friend and endless supplier of lessons to learn as I figure out how things work, or don’t. I love your story of how Orion fit into your life for so many years. Wonderful tie-in with today’s technology in the picture your husband took of the two of you at the end. I was so happy not to read a story about a friend (human) who died. 🙂 I, too, have “things” to which memories are attached and as such, are difficult to get rid of. They certainly can be difficult to get rid of. Enjoyed the photo. Great picture and unusual story who writes about old TVS 😶? oh .. Janet of course. And why not? Just the other day we were talking of the family owned radio-box ‘His Master’s voice’ around which we gathered to listen to live commentaries of man’s first step on the moon. And the gramophone/record player with the trumpet looking speaker which invited everyone to ‘Rock around the Clock’ – or crooned about Bellafonte’s Island song. They were both part of of our history, and I guess future generations might like to hear the stories ..so it is nice that you wrote about Orion who was a part of an era when things lasted for years. Would be great if we had room to keep all these … 🤔or may be not. We may get too attached to things. It is enough to have the memories … and the very creative photo. Thank you sooooo much, Rose. Ya know, we have a big old house that keeps so much stuff….basement to attic…from all three of us who live here. I just have to begin clearing out somehow or another. However, since all three of us have lived and traveled and collected…well, how do you get rid of memories of places, even if they are small trinkets… mercy. I loved the name you gave your family radio… His Master’s Voice. Perfect! Now you can write a memory story too! Wow! a family owned HIs Master’s Voice! I loved that. And a record player with a trumpet speaker. Those are classics. Okay, Rose. It’s time to write your memory story!! Yeah … maybe I will follow your inspiration 🙂 You are fortunate tho you have a picture to treasure along with the memory. I think you made the right choice on this one, Janet. It’s hard to let go when you’re still holding on. Thanks, Allan. 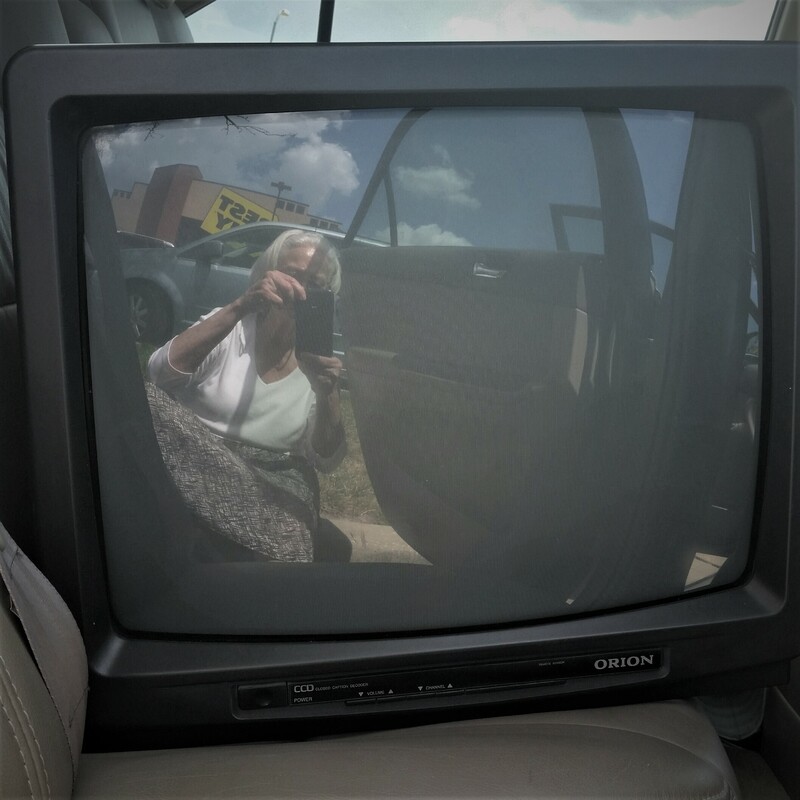 I’m not sure yet how to make memories with this flat screen… LOL. Well, I have one. Me, standing with remotes in hand, calling my son up to help me figure out which button I’d inadvertently hit which made the picture go away completely! Oh. Hit the 3 button. Okay. Hah! I know what you mean about new devices and their remotes. Someone needs to design a casual bandolier to wear and keep the remotes handy for us as we go about the house. Allan, I didn’t have a link below your last comment, but I absolutely love the idea of a bandolier with pockets for remotes! Although I’d need to add a couple more pockets: one for the instructions and another for my glasses so I can read instructions!! Excellent ideas. I overlooked the essential first steps on this one. Hi. I was wondering what the photo is all about. I found out, of course, in the final paragraph. That TV served you well. It was built to last. Thanks Neil. It’s a mystery photo for sure…as much mystery as owning all the stuff we seem to hold on to. A moving story. I, too, attach memories to objects that played key roles in my life. I like this picture and tribute to your old friend Orion! Thank you, Susan. I’m grateful Cliff suggested taking the photo. New technology catching old technology. Odd how hard it was to get rid of that old set.